Will the Next US Pacific Command Head Be an Air Force General? U.S. Air Force Gen. Terrence O’Shaughnessy appears to be the most likely candidate. U.S. Pacific Air Forces Commander Gen. Terrence O’Shaughnessy appears mostly likely to succeed Adm. Harry Harris as head of U.S. Pacific Command (PACOM), Defense News reports, citing multiple sources. The PACOM head position usually goes to a naval officer. Indeed, should O’Shaughnessy succeed Harris, it would be the first time that a non-naval officer has held the position. Even as O’Shaughnessy appears to be favored for the role, his nomination could face obstacles in Congress. For instance, Senator John McCain — chairman of the Senate Armed Services Committee — is known to favor the Navy and may oppose O’Shaughnessy initially. According to a source who spoke to Defense News, the U.S. Navy is likely to nominate Adm. Phil Davidson, who would come to the role from outside of the Pacific Fleet. Davidson previously commanded the U.S. Navy’s 6th Fleet. Rumors of O’Shaughnessy’s likely path to the PACOM commander role come after Admiral Scott Swift, the current commander of the U.S. Pacific Fleet, announced that he would be retiring in September. Swift’s announcement came after multiple high-profile at-sea collision incidents involving two U.S. Navy Arleigh Burke-class guided missile destroyers, the USS Fitzgerald and USS John S. McCain. 17 sailors died between the two incidents. Under normal circumstances, Swift could have been expected to succeed Harris. He did not specify a reason for his retirement nor did he note a date, but it is widely understood that the Pacific Fleet’s accidents may have precluded his ascension as PACOM commander. Harris is expected to retire in 2018 and may be appointed to an ambassadorial position in the Asia-Pacific. In August, the Washington Post reported that Harris was under consideration to serve as the next U.S. ambassador to Australia, an important U.S. ally where Harris has considerable experience in his role as PACOM chief. The next PACOM commander will inherit a tense environment in the command’s Indo-Pacific area of responsibility. Amid ongoing Chinese military expansion and threats from North Korea, Pacific Command will face a range of challenges. O’Shaughnessy has overseen Pacific Command’s various Air Force-related initiatives. Most recently, as commander of the Pacific Air Force (PACAF), O’Shaughnessy has overseen PACOM’s bomber presence missions in the Pacific, which have been used to signal U.S. resolve toward North Korea. 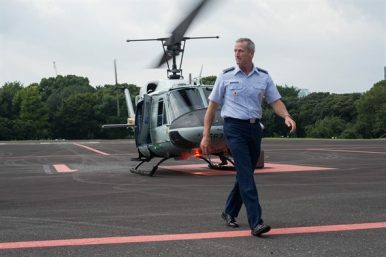 In August, following North Korea’s launch of an intermediate-range ballistic missile over Japan, O’Shaughnessy traveled to Yokota Air Base to meet with the Japanese Air Self-Defense Force’s Chief of Staff Gen. Yoshiyuki Sugiyama and commander Lt. Gen. Hiroaki Maehara. The exercise is the second show of force in East Asia involving B-1B bombers since North Korea's sixth nuclear test.